It's Sunday and all your friends are at the beach. Be adventurous and discover Buck Island beach, one of the most beautiful beaches, also known as Turtle Beach. Departing from Christiansted at 1:30 and returning at sunset this beach only trip is the perfect Sunday afternoon. Coolers of ice are provided for storing all your favorite food and drinks. *Buccaneer Pickup Not Available for this tour. 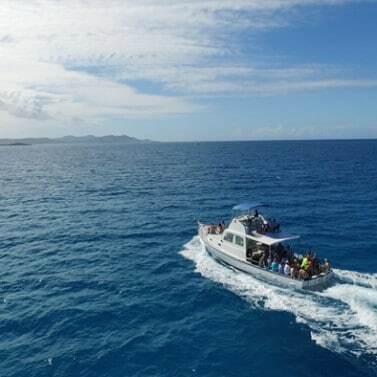 We require a minimum of 10 guests to operate this trip, we highly encourage to call prior to booking or bring a group to ensure your plans go off without a hitch. You will automatically receive your reservation confirmation when the tour minimum of 10 guests is reached. If you have any questions, comments or concerns please don’t hesitate to reach out.